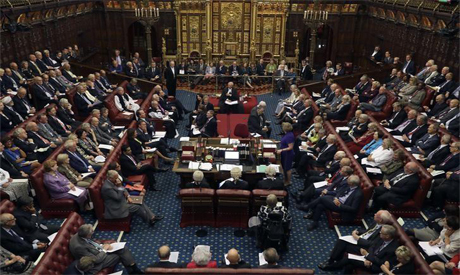 Members of Britain's unelected House of Lords voted Monday to allow parliament to block the government from leaving the EU without a deal, although the motion must be approved by MPs before taking effect. Lords voted 335 to 244 for an amendment to give lawmakers the final say on the outcome of Brexit negotiations with Brussels -- including staying in the bloc if they do not like the final agreement. Prime Minister Theresa May's Conservative government had previously indicated it would fight the motion when it returns to the House of Commons for debate in the coming weeks. "What this amendment would do is weaken the UK's hand in our Brexit negotiations by giving parliament unprecedented powers to instruct the government to do anything with regard to the negotiations, including trying to keep the UK in the EU indefinitely," her spokesman said. The government has promised MPs and peers they will be able to vote on the Brexit deal, which it hopes to strike in October, ahead of Britain's planned departure from the EU in March 2019. But if parliament rejects it, the only current alternative is to crash out with no deal, a prospect many warn could cause legal chaos and significant damage to Britain's economy. Conservative peer Viscount Hailsham, one of a number of cross-bench supporters of the amendment to the EU (Withdrawal) bill, insisted lawmakers must decide what happened. "If the decision is to reject those terms (of the Brexit deal), parliament should have the right to suggest further negotiations," he told a packed chamber. "Or to determine that we leave the EU without terms, that is to crash out, or to determine that we stay in the EU on the existing terms." He added: "In the event that no terms have been agreed (by the government), the same choices should be available to parliament." But ministers argue the move is an attempt to "thwart Brexit", saying the British people made their choice to leave the EU in the 2016 referendum. Former Conservative leader Lord Michael Howard told peers the amendment could lead to "not one but several constitutional crises". "I'm afraid it illustrates the lengths, the appalling lengths, to which the diehard Remainers are prepared to go to achieve their aim," he said. Britain triggered the two-year Article 50 process of leaving the EU in March last year, meaning that it will automatically withdraw from the bloc on March 29, 2019, unless all 28 members agreed to extend or revoke the process.